Have you ever struggled with how to measure quality of life in a senior dog? I know I have, and if I never have to do it again it will be way too soon! Over the years I have fostered and adopted several old dogs with some health issues. They were well cared for both by us and the vet, and we did all we could to ensure their quality of life was good. It was always clear when it was time to let them go, and as heartbreaking as it was, I never questioned our decision. I do not believe in allowing animals to “linger” or heaven forbid suffer, because it’s too hard to say goodbye. 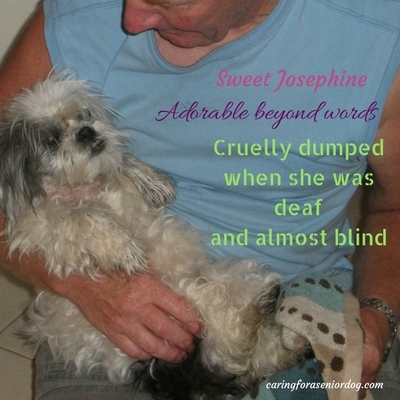 Josephine was a deaf and mostly blind Shi Tzu we permanently fostered. It was the first time I was ever faced with a quality of life issue, and boy was that tough. When we first brought her home she was able to see a bit, but about a year later, in a split second, the lights went out for her and that’s when the hard times began. Deaf and blind, conversations about ethics and quality of life starting cropping up, with no real answer. I rely a lot on my vet to help me care for my animals, but I didn’t have that “great vet” at the time. As she developed more and more issues, I struggled. When she was diagnosed with diabetes and I needed to give her insulin shots, it became a constant source of worry and anxiety for me. It wasn’t so much the shots that were the problem, it was that she would cry a little when I gave them to her. The poor thing had no idea what was going on and that broke my heart. I took her to the vet and we had “the” conversation. I have said goodbye to many animals, but it was the first time the decision came down to quality of life. All her issues were manageable, but it was a question of whether or not it was right. I ended up putting her down that day, but I never felt completely at peace. Did I wait too long? Should I have waited longer? When I look back I’m sad I didn’t do it sooner, but in these types of cases it can be so difficult to know when. What do you do, look at a calendar and pick a date? I imagine this can easily turn into a conversation about ethics, and I may have that conversation in the future, but not now. As I’ve mentioned it was my only experience with “quality of life” and felt compelled to share it. There’s some very helpful information in that post, including an interesting interview with a Dr. Silver. He discusses the measures of quality of life, the creation of questionnaires to help vets and pet parents with this very important issue, as well as research he has conducted on the use of cannabis in pets. Saying goodbye is about as heart wrenching as it gets, and we seek comfort in knowing what a wonderful journey we shared. Understanding how to measure quality of life in a senior dog will go a long way to ensuring our pets live the best life we can give them, and help us know when it’s time to let them go. Have you ever had to make a decision based on quality of life? How did you ultimately make that decision? Did you rely on the advice of your vet? If you’d like to share your story, I know it will help others facing this very difficult time. Tell us in the comment section below or on my Facebook page. Oh gosh, this broke my heart. Josephine felt your love and was so lucky to have you at end. I imagine this must have been so painful for you. It really was so tragic. How kind of you to care for that cat, he obviously knew which doorstep to land on. I imagine the decision to let him go must have been difficult, but it certainly sounds like it was the best one for him. I had a feral cat and I know what that behaviour is like. I’m sure he never could have tolerated that kind of confinement, you made the kindest decision for him. It is the most difficult decision to make, whether or not you should proactively say goodbye to a pet. We had to do it with my childhood dog. I was just a kid then, but I could see she was suffering. My parents decided to say goodbye to end her suffering. My cat Maggie was also very ill, the Vet wasn’t certain what it was but she seemed miserable and her quality of life was almost nonexistent. When she started sleeping nearly 20 hours a day and would wake up howling in confusion and/or fear I decided it was enough. I had a home euthanasia, I didn’t want her in a Vet’s office on a steel table. I wanted her on our couch with me looking in her eyes and petting her. It was so hard and sometimes I do question if it was the right time. Great post Hindy. Not an easy topic to write or speak about for sure. This video is great, so helpful. As hard as it must have been to be a kid and seeing your dog suffer, your parents made the right choice to end her suffering. Sadly there are people who do whatever they have to, no matter the cost (financial, spiritual and animal suffering) because they can’t say goodbye. I’ve never said goodbye at home but I’m sure Maggie was much more comfortable in her own environment, spending her time with you. It really is a terrible topic, but my hope is that it forces people to make the decision based solely on what’s right for their pet, and they never let them linger simply because they can’t face saying goodbye.